I wrote here a few months ago about my wife’s decision to replace her 1998 Olds Intrigue. I detailed my grand plan to give her the 2006 Toyota Avalon while I procured myself a slightly used Mercedes S550 as a new daily driver. The interesting thing about the Mercedes S550 is that, without expensive and rarely-equipped options, it offers fewer bells and whistles than a minivan of half the price. Consequently, it was near impossible to find one with adaptive laser-guided cruise control and a back-up camera, at least one with a reasonable number of miles that wasn’t being sold by a dealer at a typical narcotics kingpin’s profit margin. I did finally find a low-mileds 2008 S600 (the model with all the bells and whistles as standard, powered by the fire-breathing bi-turbo V12 and usually purchased new by professional athletes and CEOs) offered at a sell-it-today price of $72,000, but getting it to my door and licensing it would have put it at $80,000. Still, at nine in the morning on one beautiful day I had the deal ready to go. It had taken me months to get to nearly buying the S600, but thanks to my wife’s decisive nature, by 5pm that night she was at Titus-Will Hyundai signing for a brand new 2010 Genesis 4.6 Sedan–for her! A Hyundai? On my property? What the hell? In all fairness, my wife knew I had talked about the Genesis ever since seeing a pre-production version years ago at Pebble Beach, and also was aware that I gave a stripped version just a passing test-drive before pursuing the Mercedes. For her it was a strictly rational decision to revisit a possibly overlooked option and jump on it when it met all the right criteria. I’m here to tell you, though, that as far as rational large sedan purchases go, the Hyundai Genesis is a surprisingly emotional hunk of metal. It’s easy to have missed hearing about the Genesis Sedan, because Hyundai has opted to spend the bulk of its marketing dollars on the Mustang-fighting Genesis Coupe and its recently redone Accord-killer Sonata. The Genesis name was actually originally designed to be placed on a new luxury brand a la Toyota’s Lexus, Honda’s Acura and Nissan’s Infinity, but after realizing that a stand-alone brand added over $5,000 to the cost of each car, Hyundai elected to make the Genesis a new upscale rear-wheel-drive product line under its primary brand and dealerships. 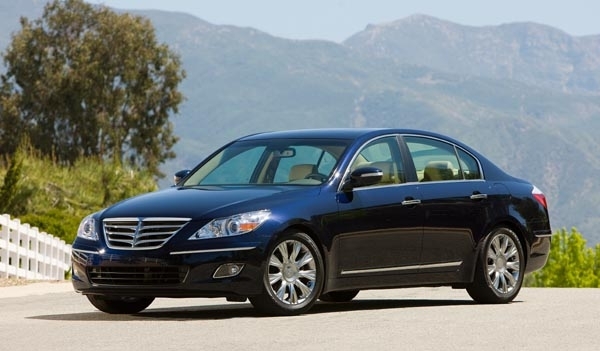 At 196 inches, the Genesis sedan is a large vehicle sized to match the BMW 750i, Lexus LS and Audi A8. It is slightly smaller than the long-wheelbase versions of the aforementioned, as well as the Mercedes S550 and Toyota Avalon. Genesis Sedans are available with a 3.8-liter V6 or the 4.6-liter “Tau” V8 — and given the options on the 3.8 that come standard with a 4.6, a fully loaded V8 is only about $2000 more. With a real-world out-the-door price with tax and licensing of under $45,000 for this top-of-the-line Korean, it is a steal…and one that has already picked-off sales from prestige luxury brands. At first glance, the Genesis is visually indistinguishable from the current crop of luxo-rides, and if you park one next to a same-colored Lexus ES350, you’ll find yourself looking for badges or the slightly longer car. With most of the lines stolen from Mercedes, BMW and Audi, it’s even more surprising how the overall design blends nicely into an outcome that is very muscular and handsome, especially in Black Noir Pearl paint. The interior is very visually pleasing with contrasting leather (in this case, Cashmere,) and offers supple surfaces with nice stitching, Lexus-like panel gaps, and an uncluttered layout for buttons. Cost cutting is only noticeable to guys like me who recognize the plastic HVAC buttons as being from the same supplier as cheaper Toyotas. Delivering niceties like a backup camera, parking sensors, adaptive cruise control, rear sunshade, iPod and USB connectivity, Bluetooth, and navigation system with a usable input device for forty-some-grand means cost cutting somewhere else. It didn’t take me long to find these areas. While the driver’s seat offers a basic level of cushion angle adjustment, lumbar support, heat and ventilation, the passenger seat is a fore-aft only deal with heat, but no ventilation, cushion height adjustment or lumbar support. Luckily, both seats are well bolstered and as comfortable as the base seats on the S550. 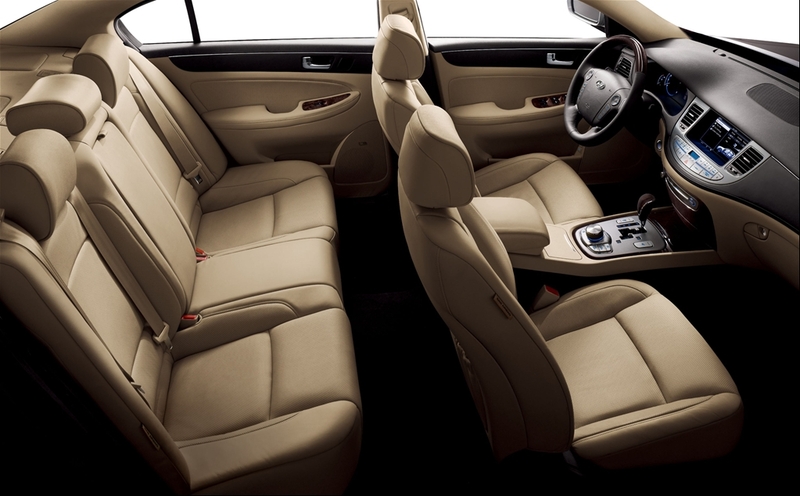 As for rear seat room, it’s limo-like comfortable and offers almost as much space as the German long-wheelbase luxury players. Push the starter button and the Tau 4.6 V8 comes to life. Like any modern overhead cam V8, it is as unobtrusive around town as Loggins & Messina over a department store Muzak system. Punch it, though, and it announces its presence with authority…and rear wheel spin. Gearing from the ZF six-speed automatic transmission plays well with the Tau’s 375 hp and 333 ft-lb of torque to deliver 0-60mph in 5.7 seconds. For a 4000+ pound sedan, this is quicker than a New Jersey mugging. With minimal seat time, I still questioned if the Genesis V8 could blend all of its strengths under pressure, so I decided to take it with me to my friend’s house for our annual fantasy baseball draft. The trip has always proven a great test of cars, providing 70-plus miles of highway, a few miles of city traffic, and a final leg of a mile-long hillclimb of limited-access tight switchback road that looks like a special rally stage. As I entered I5 North, I set the adaptive cruise control. Almost immediately I noticed the speedometer needle reading 2mph higher than the digital readout for the cruise control setting. Odd, indeed, and most certainly an unnoticed bug (or as product marketing guys say: “a feature”). With adaptive cruise control a new addition for the 2010 model and a part of the optional Technology Package, only a small percentage of Genesis owners have witnessed the different speed readouts competing for their attention. Luckily my trusty iPhone speedometer application determined that it was the cruise control display, not the speedo needle, that was correct. On I5 the Genesis delivered a par-for-the-course 22 mpg on premium gas. A 20-and-change gallon gas tank meant the needle didn’t dip too far. During the trip the car’s easy to identify corners and lack of bad blind spots meant tightly contested lane changes were a breeze. After the highway portion, my normally sore back was still in great shape. My ears, though, felt like I had been making the trip in my Corvette. Road noise was horrible, but can mostly be attributed to the deafening hum from Dunlop tires. Through the stoplights and traffic the Genesis displays the smoothness of a $5 bottle of tequila. The ZF transmission tended to hunt for gear and delivered binary throttle tip-in from a stop: either waiting too long for a gear to engage or dislocating head from neck as the car rocketed away like it was being timed for acceleration. Sadly, this behavior seems to be de rigueur now as manufacturers use increasingly complicated shift logic to maximize EPA fuel mileage ratings at the expense of driver comfort. I made the turn-off onto the final mountain climb and punch the throttle. The Genesis built speed rapidly. With the shifter in manual mode, I prodded on the brakes, which instantly scrubbed enough speed to allow a downshift as I enter the first decreasing radius turn. The Genesis followed steering inputs perfectly. The Tau V8’s torque enabled a little tail-steer to leave the corner, as well as to deliver a quick burst of speed before needing to slow for a hairpin. Steering in the Genesis is heavy, but direct. There’s plenty of feedback, but with springs stiffer than moonshine and strong-sidewall Dunlop tires, the ride feels more 1984 Corvette than 2010 BMW. Brakes bite too quickly, but it feels like throwing the Nimitz’s anchor out to stop a kayak. On the gas strongly, gravel on the road gave the traction and stability control a workout. Unlike in Toyota and Lexus cars, not only were the electronic nannies less intrusive, they could be turned off if desired. Given my lack of experience with this new, large, heavy sedan, however, it was probably a smart idea to keep them on. After a few more turns, the heavy steering began to weigh on my arms. Still, as I reached the top of the mountain, I realized that I had bested times I had achieved in my 1986 Ferrari 328 GTS and matched those of my 2002 Corvette –a pretty impressive feat. At the end of the day, there’s no doubt that Hyundai executives tasked its engineers to create a car that could beat the handling and braking figures for BMW and Audi. On that, the Genesis is a home run. Given the cost-cutting necessary to build to a target price, however, there are some trade-offs in noise, comfort and refinement. Think of the Genesis as to the world of executive performance sedans as the Corvette is to sports cars: the snobs might snicker at its badge and joke about the noise, vibration and harshness in comparison to German rivals, but it can wipe the smirk off their faces with its performance and still leave its owner with at least an extra thirty-large in the bank. 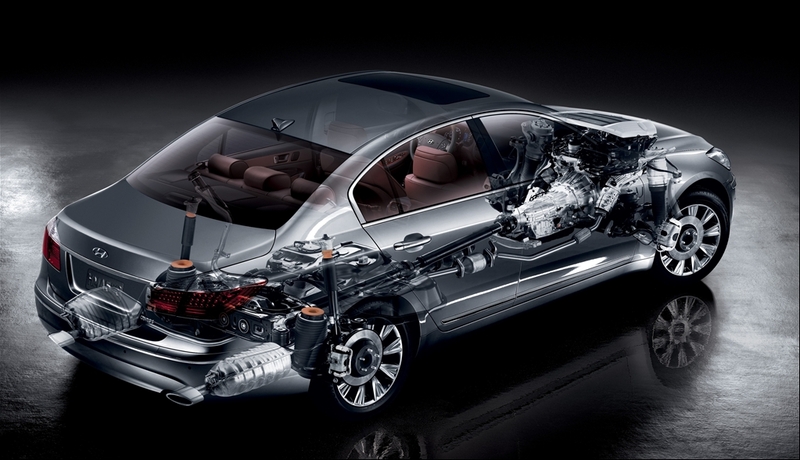 You’re looking at the first official “glimpse” of Buick’s 2010 LaCrosse. This picture was intended to excite journalists — the thinking was that it shows that the LaCrosse looks like the Invicta show car. Sorry guys. All it indicates to me is that the Buick boys are still asleep at the wheel. What I see is more vanilla than desert at a retirement home dining hall. As a guy who was brought home from the hospital in a Buick Special Convertible and had a Buick LeSabre as his first car, I say this to Buick: I’ve been in the Hyundai Genesis and it simply is a better Buick than anything Buick has on showrooms or in the pipeline. If this is all you Buick product managers have to excite us, you might as well save on the PR and marketing costs and just throw the LaCrosse at the dealers and hope enough old folks buy them to justify the brand not going the way of Oldsmobile. 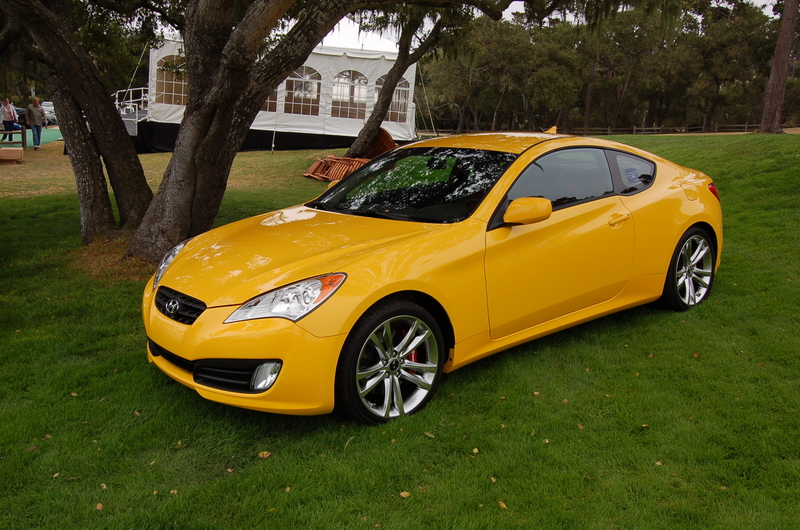 Spotted: 2010 Hyundai Genesis Coupe At Pebble Beach! When covering all the happenings here at Pebble Beach, you’re on the lookout for new cars and prototypes. 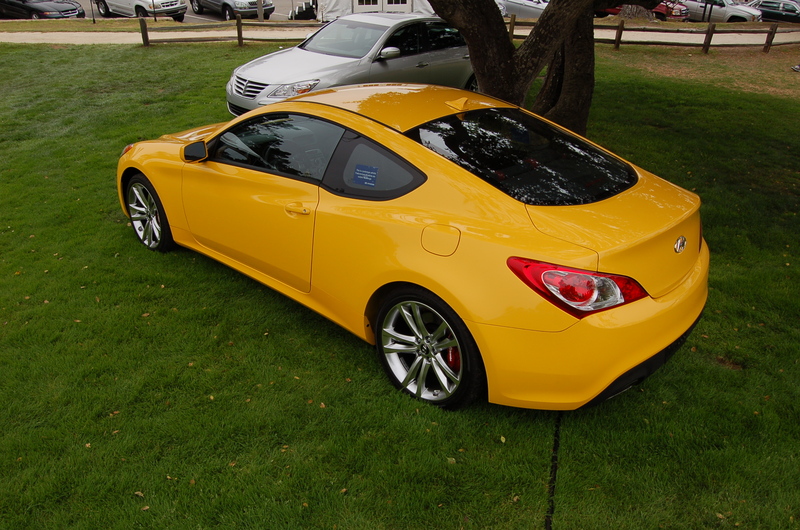 Today I noticed a Hyundai Genesis Coupe prototype sitting with a production Genesis Sedan parked off to the side of the Blackhawk Exposition. One thing is for certain: this is by far the prettiest car Hyundai has ever produced. Hell, I’ll go on record saying it will be one of the most beautiful cars offered period when it is offered in showrooms. Everyone who walked by (and we’re talking about people who can afford to drop six and seven figures on things with four wheels) thought it was downright perfect in proportions. Everyone was stunned to see the “H” badge! and independent suspension) and build/engineering quality of equal caliber. While journalists have been throwing praise at Chevy for the 2009 Camaro, Cadillac for the upcoming CTS Coupe, and Dodge for the now-arriving Challenger, the sweetest looking two-door to hit the “coming soon” pages is actually from Hyundai. 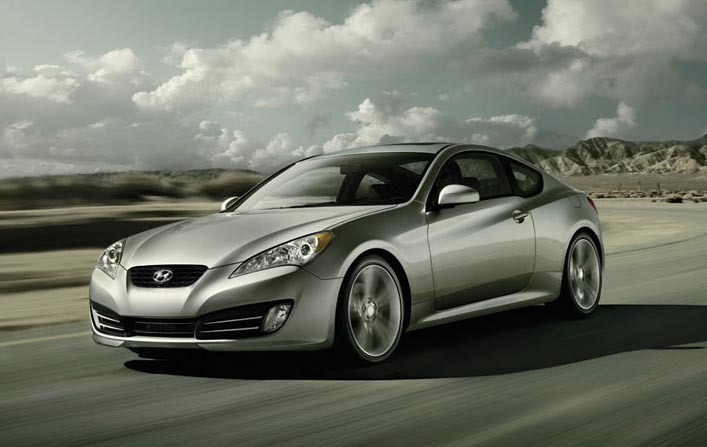 The Genesis coupe is simply a work of art. GM, Ford and Chrysler: beware! 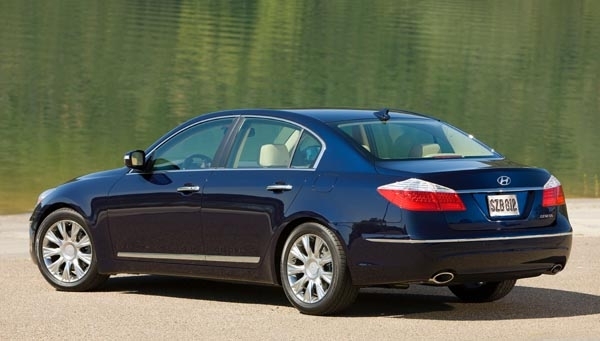 The 2010 Genesis (due out in 2009) is not destined to be another rice rocket in the mold of the Acura Integra. Hyundai has instead designed it to be an American-like pony car to do battle against the Mustang. Don’t laugh – when it hits dealerships, the rear-wheel-drive Genesis will be available with either a turbo 2.0-liter 212hp four or a high-output 306-hp six-cylinder engine. And no doubt that the V8 Hyundai has in development will be there sooner than you think! Hyundai has delivered nicely styled cars in the past. Indeed the current Hyundai Tiburon coupe obviously stole lines from the Ferrari 550 Maranello. Unfortunately, the front-wheel-drive Tiburon (as well as other cars from the Korean automaker) has always been a let down in the driving department. The new Genesis, however, has earned praise from the few journalists who have had the chance to do preview drives. Rumors are that power, handling, braking, and refinement are all top-notch for the general price and segment. What seems most important is that from a style perspective, the Genesis doesn’t seem to steal from any other car. It is fresh and devoid of all the foolish, tacky add-ons all too familiar on American so-called performance cars. There are no non-functional fake air intakes, nor are there creases or edges that are there just to maintain a corporate look or theme. In fact, the Genesis shows no evidence that the designers were out to make a unique-appearing Hyundai, rather one that would point to the future, not the past. So as GM goes to 1969 for the design of its 2009 Camaro, Dodge’s Challenger steals entirely from its 1970 version, and Ford’s Mustang soldiers on with a pastiche of 1965, 1967 and 1969 Fastback ‘Stang cues, the Hyundai Genesis proves that being new can be done without looking old. Furthermore, the Genesis will remain fresh for years to come. With better pricing and all the power of American pony cars, it’s possible that the Genesis’ show and go will translate to stealing sales not only from Mustang, Challenger and Camaro, but also from Infiniti G, Acura TL, Pontiac G8, Subaru WRX, Mitsubishi Evo, and Cadillac CTS. Who knows, maybe even a few Bimmer or Audi drivers will wonder why they’ve spent $10K-$20K more than they had to?